The November meeting of the ChicagoLand Glider Council will be on Monday, November 19th starting at 7:30 PM at the Schaumburg Regional Airport. The topic is "Flying at Parowan!" CLGC Seminar - Scheduled for 8AM-5PM on Saturday, February 23, 2019. See http://chicagolandglidercouncil/seminar for full details. 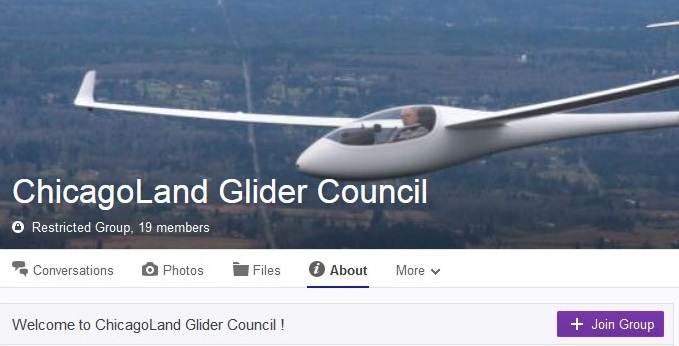 Beginning in January of 2019 all emails to our membership will be solely sent via the ChicagoLand Glider Council's electronic mail groups (Google and Yahoo). This change will allow you to control how you would like to receive the Council's emails, meeting notices, newsletters, etc. Google Group - Go to this web page and enter your personal email address information. Help on joining the group can be found here. Yahoo Group - Go to this web page, then click on the "+Join Group" button, and enter your personal email address information. Help on joining the group can be found here. Note that at this time this is a one-way-only mail distribution from the CLGC board to the CLGC membership. Thank You! 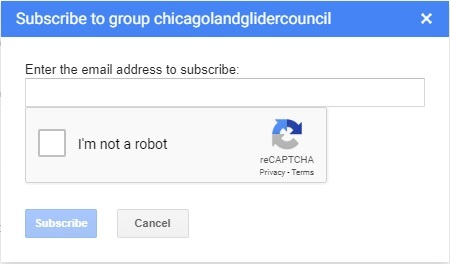 Contact info@chicagolandglidercouncil.com with any issues.